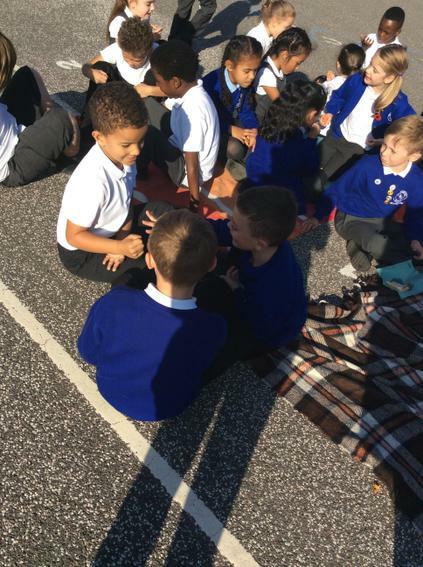 In the summer term, year 2 are going into the great outdoors! Our topic is 'into the woods' and we are look forward to learning lots in our new topic. 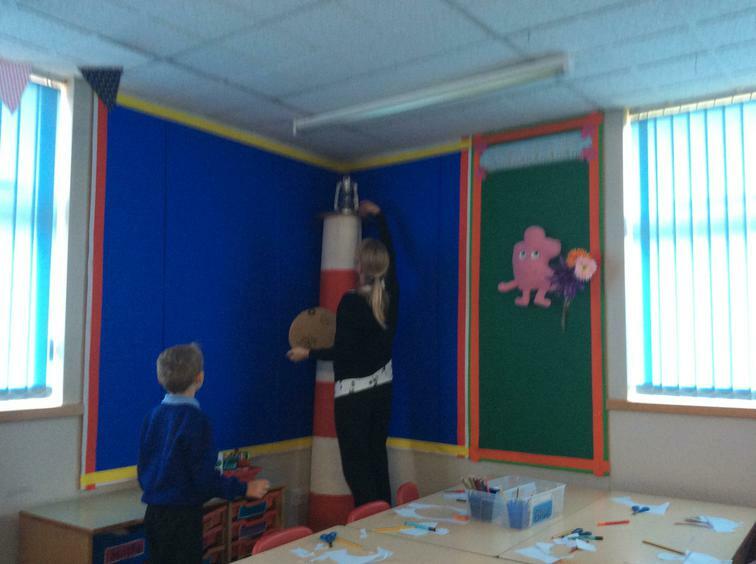 We think the children will really grow next term! As a lead associate school for the Royal Shakespeare Company, we have enjoyed celebrating another one of his timeless plays this week. 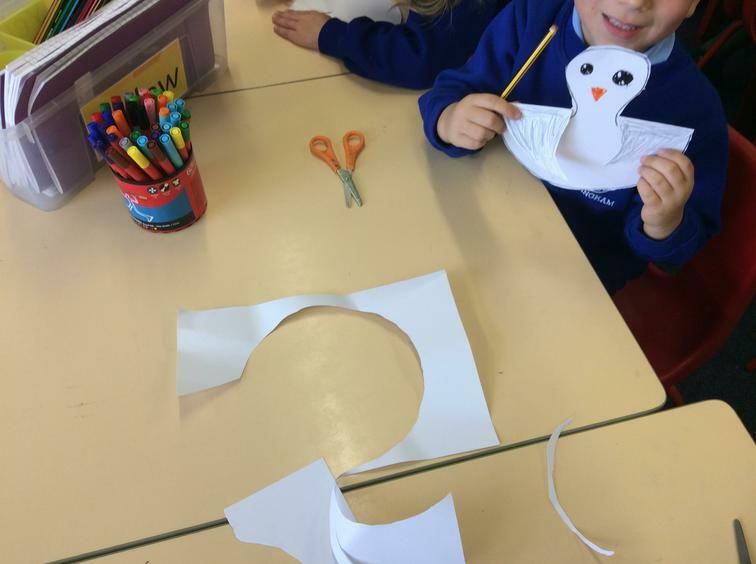 The children have learned lines from the prologue, created dramatic freeze frames and made masks for their own ball. We are sure you'll agree the masks looked fabulous and the children really embraced dancing to classical music with them on! 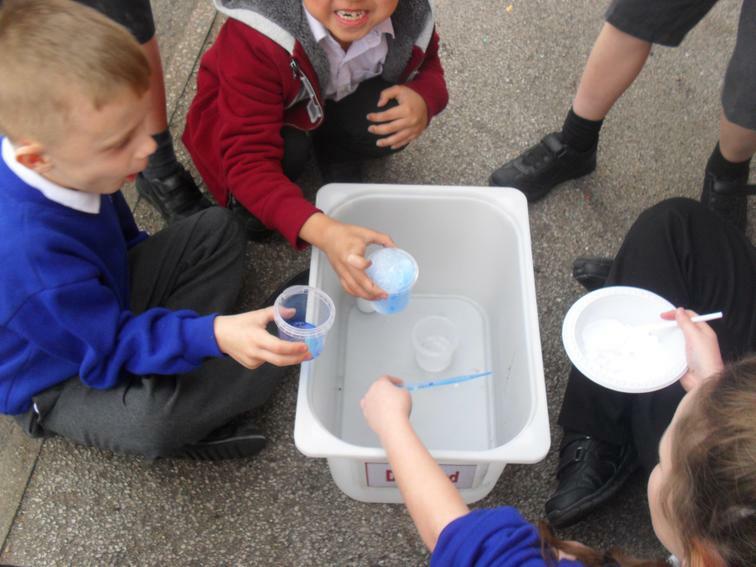 In year 2 we have been busy making bath bombs for Mother's Day. First the children designed their square based pyramid nets. 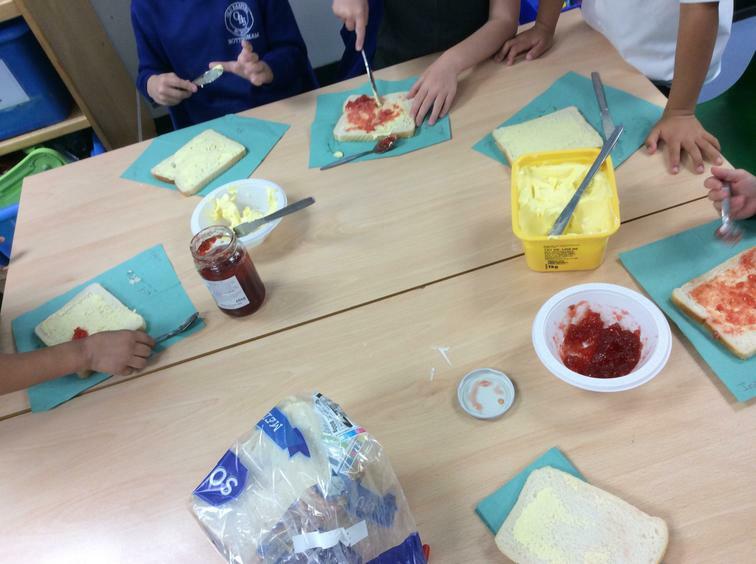 We then cut them and folded them ready for our bath bombs. The bath bombs were made with baby oil, cream of tartar and bicarbonate of soda. We then added a sprinkle of cosmetic glitter to get a lovely purple colour. 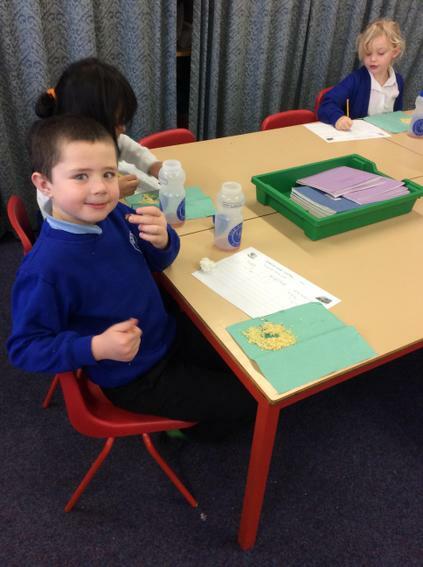 We hope our mums enjoyed their fizzing gifts! 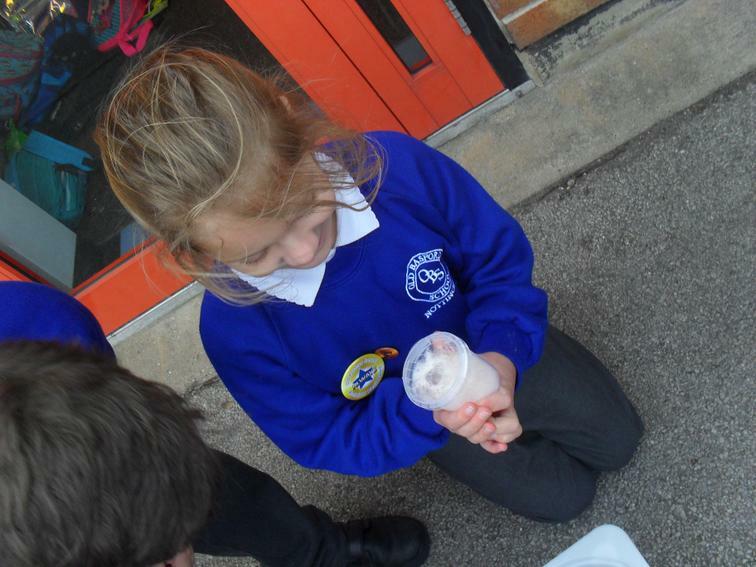 We made predictions as to what would happen when we mixed food colouring, vinegar and bicarbonate of soda together. 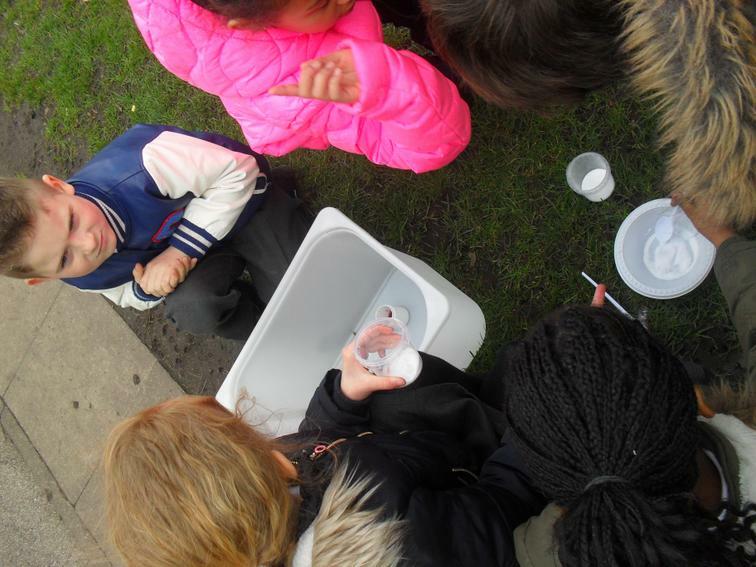 The children predicted lots of different things but we loved completing the experiment to find out what actually did happen! Have a look at our photos below. 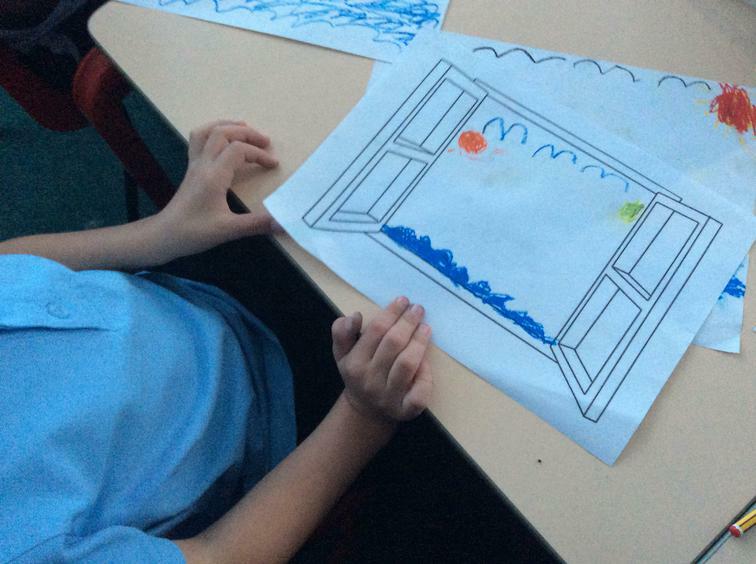 Today in our groups we have created freeze frames to represent different events in Florence Nightingale's life. We had lots of fun and we feel it has helped us remember some of the significant parts of her life. We had a brilliant World Book Day. 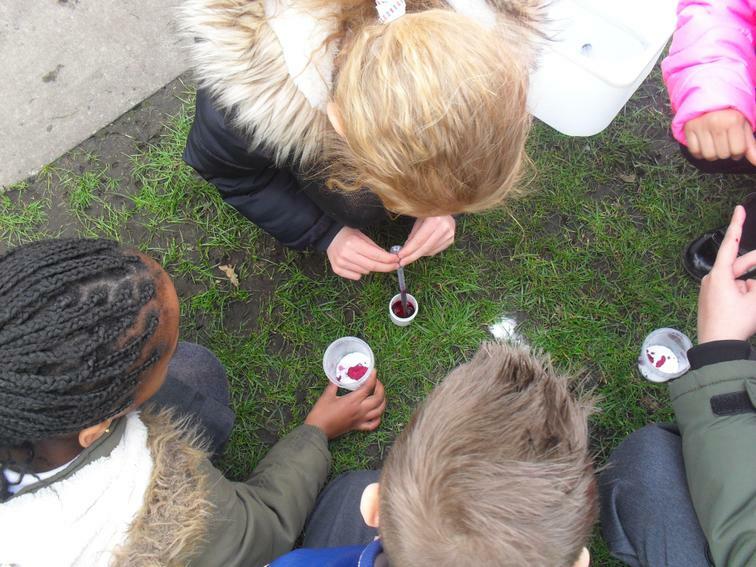 We had lots of fun measuring different colour liquids in maths to create lots of marvellous medicines and enjoyed learning and acting out one of Roald Dahl's poems. We also loved dressing up as our favourite book characters and having some children from Year 6 visit us to read us a story at the end of the day. We look forward to year 2 joining us for our wow day to launch our new topic! 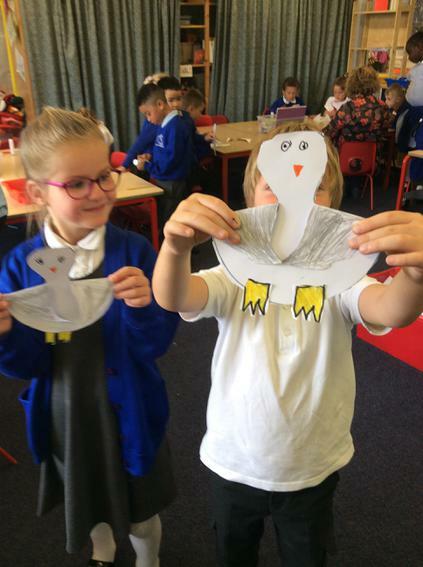 We were amazed by the creative homework projects we received from year 2 to celebrate our Africa topic. It was obvious that lots of time, care and thought had gone into creating them. 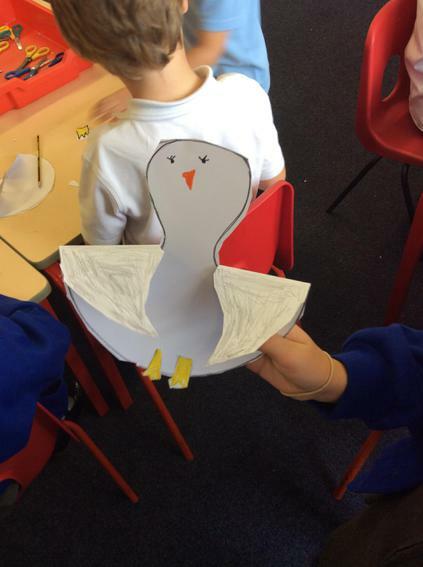 Thank you so much for your hard work year 2 and your grown ups! 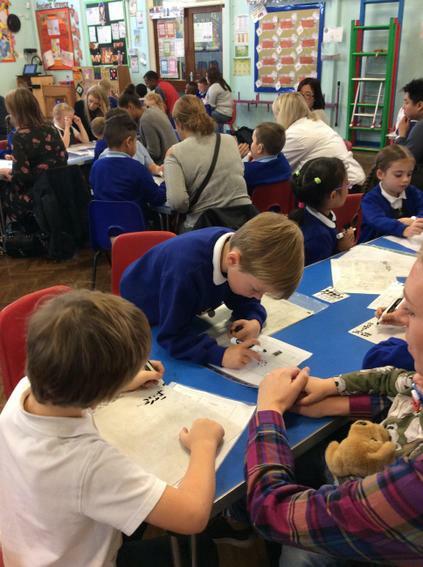 We want to say a big thank you to the parents who were able to join us and make our reading workshop in January a big success. 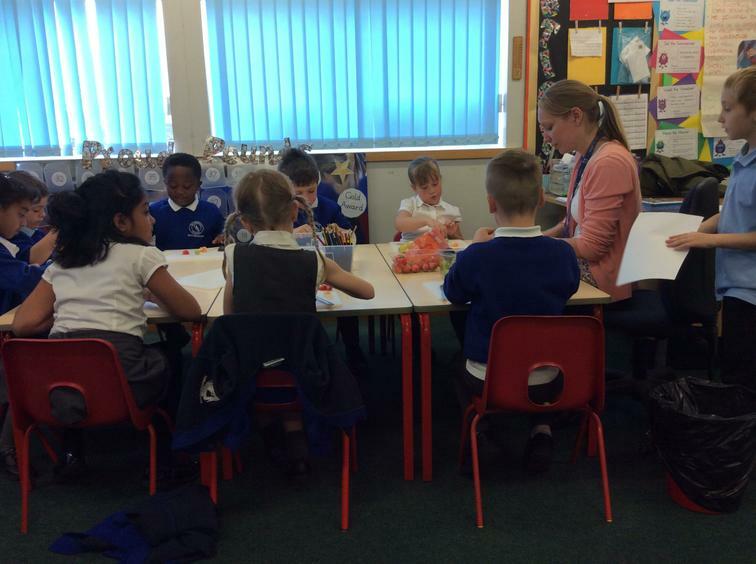 The children all really enjoyed the workshop, especially showing the grown ups how good we are at shared reading. 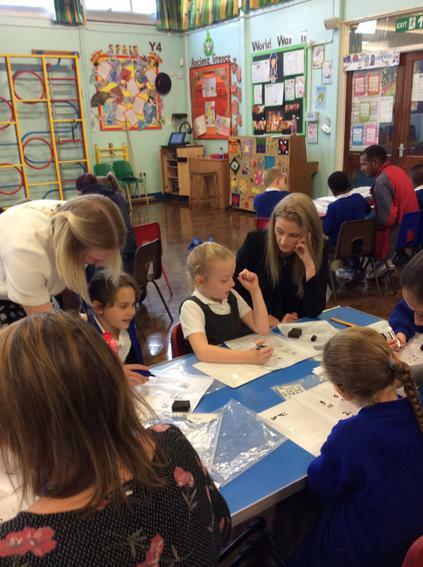 It was lovely to hear how much they learned and the positive feedback from the adults who joined us was a pleasure to read. Take a look at some of our photos below. 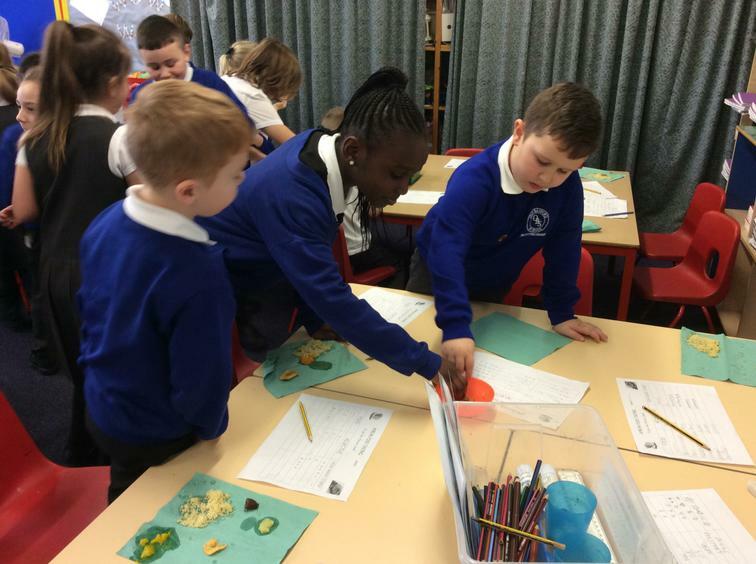 Well done to those children who worked it out, our new topic this half term is Africa. 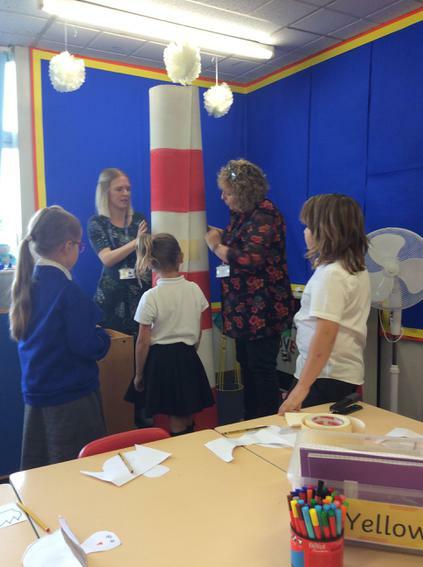 We have already celebrated our topic with an exciting launch day. 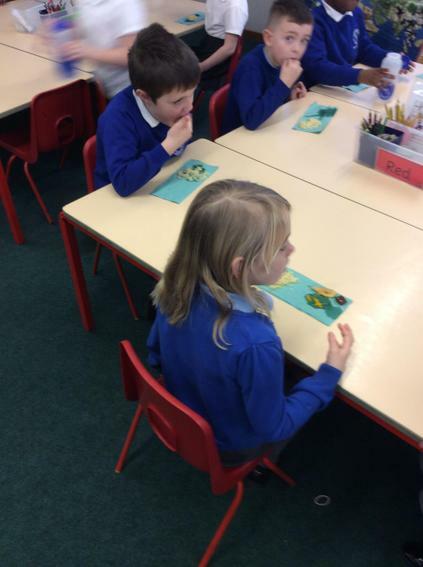 Year 2 enjoyed drum playing, pattern creating, food tasting and mask making, it was a brilliant day which the children really enjoyed! 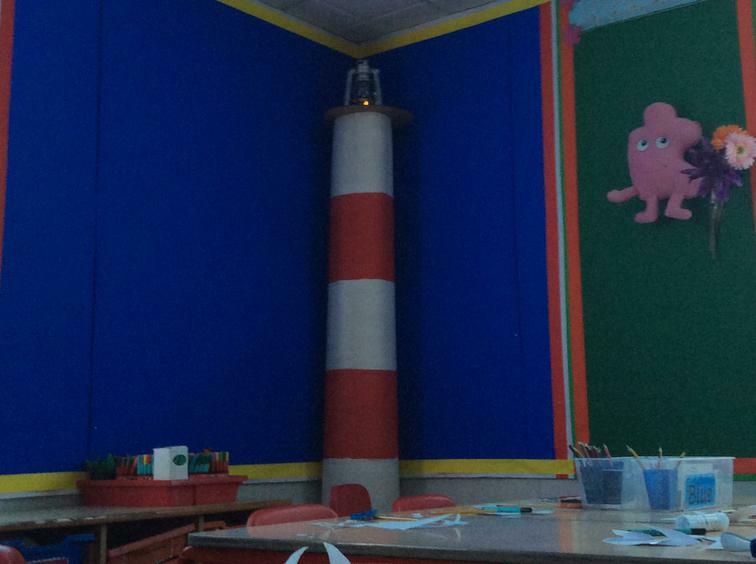 After the half term year 2 will be going on tour around a mystery place. Can you work it out from the clues below? This half term we have been blown away by how brilliantly the year 2 children have learned their lines, dances and songs to make our show such an amazing performance. Everyone has made such an effort to make our show the best it can be. We want to say a big well done to year 2 and a huge thank you to the parent's who have helped with lines and songs. 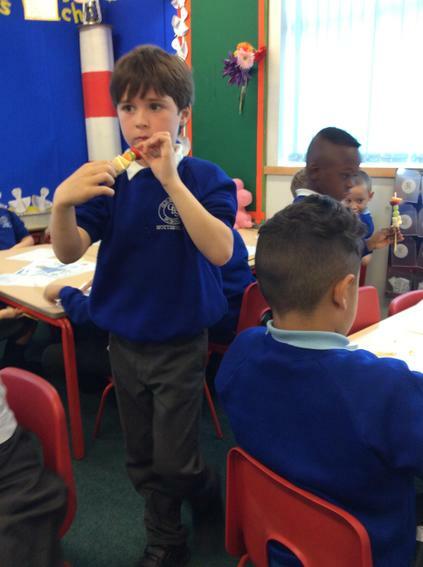 To raise money for children in need year 2 were brilliant at bringing, buying and eating cakes! We also came in fancy dress spotty outfits for a 20p donation on Friday 16th November. Well done year 2, we raised over £30! 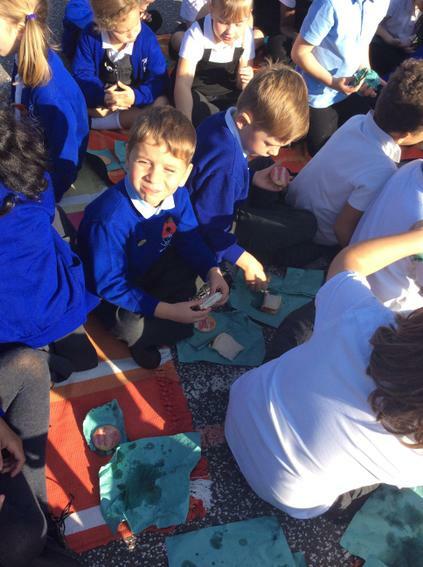 Year 2 were absolute stars on remembrance day. They were very thoughtful when we discussed why we wore poppies and they created their own beautiful poppies which they wore with pride. Everyone commented on how brilliant the children looked in assembly! The children were also great at locating countries on a map by their war medals. Well done year 2. 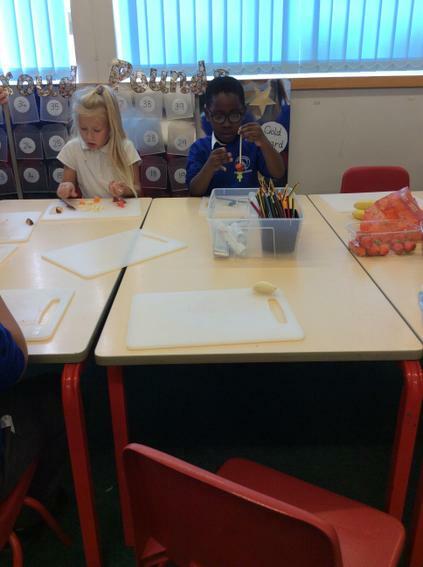 In Autumn 2 we are going to be learning all about different journeys. 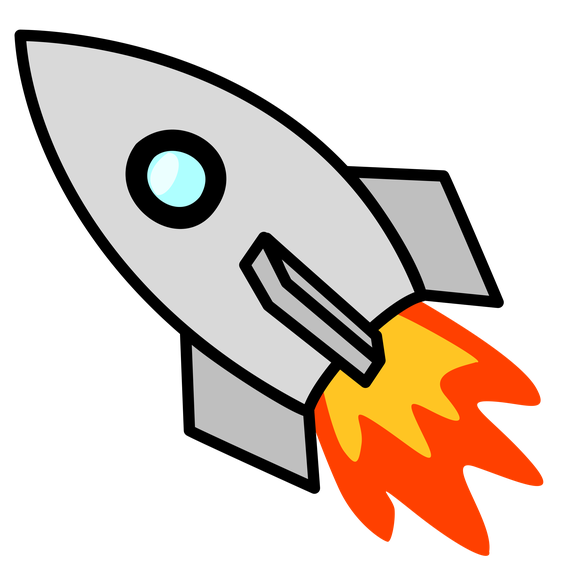 We will be finding out about the lives of some famous astronauts, what materials would make a good space suit and we will be creating art inspired by the galaxy. We can't wait and we hope the children are excited too! 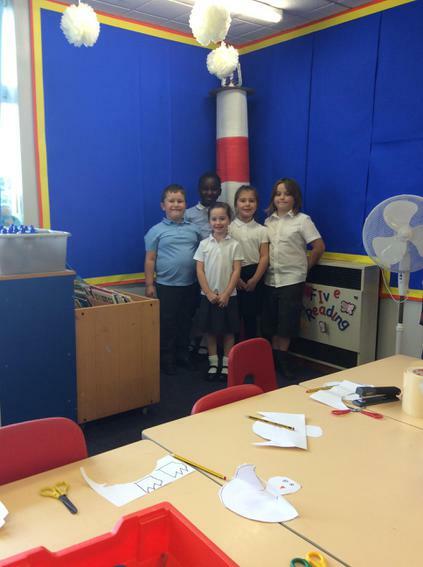 To celebrate finishing our 'lighthouse keeper's lunch topic' we had our own celebration day just like Mr Grinling. 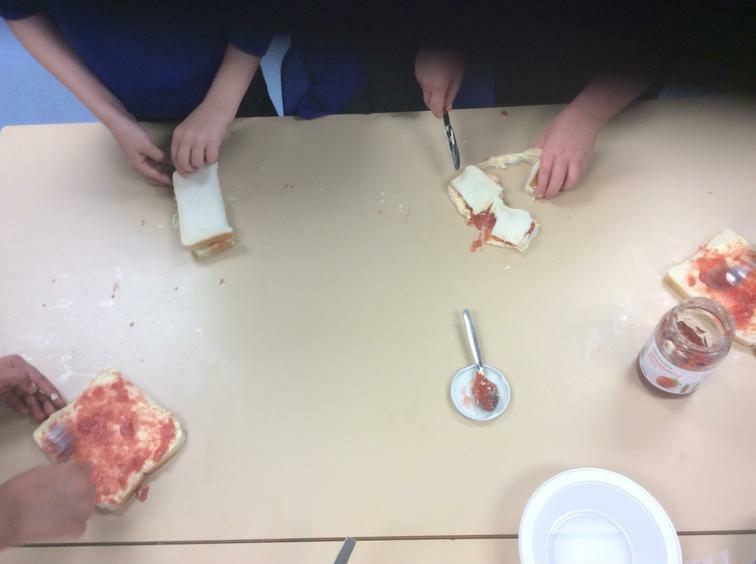 We made lighthouse collages, jam sandwiches and lighthouse iced biscuits. 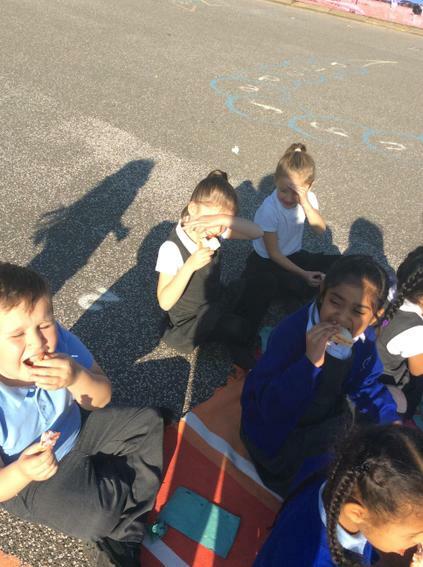 We enjoyed eating the yummy food at our sunny picnic out on the playground. 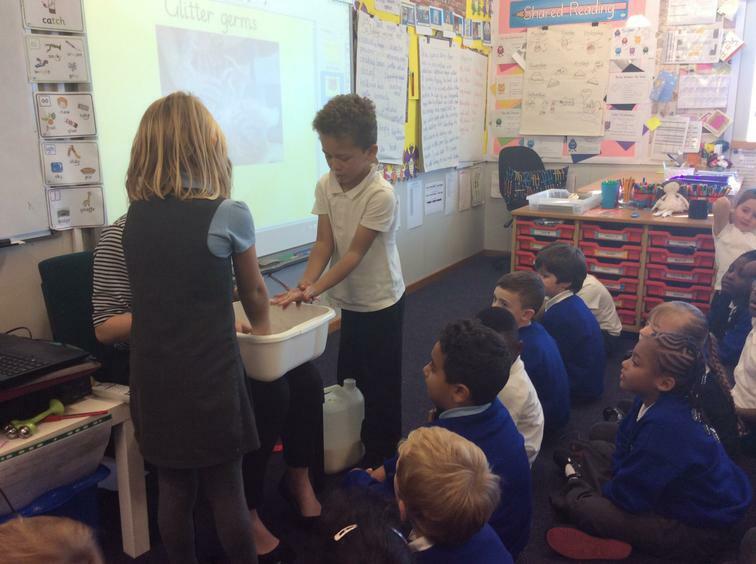 We also learned how to clean our hands properly so we can keep the germs away. 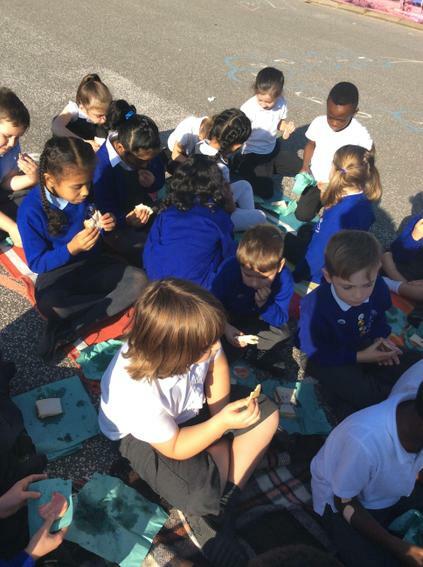 Year 2 thought it was the best day ever! 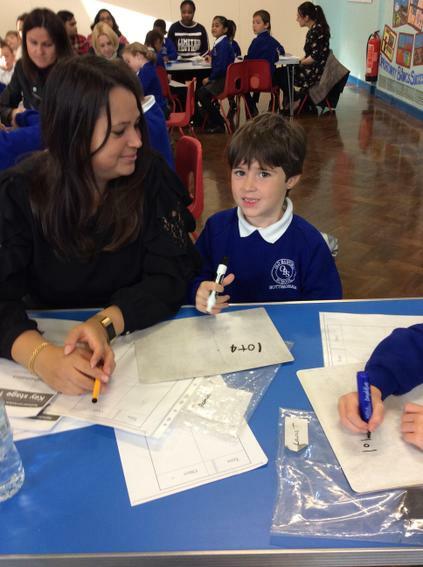 On Thursday 5th October we invited our year 2 parents to join us for a maths workshop. 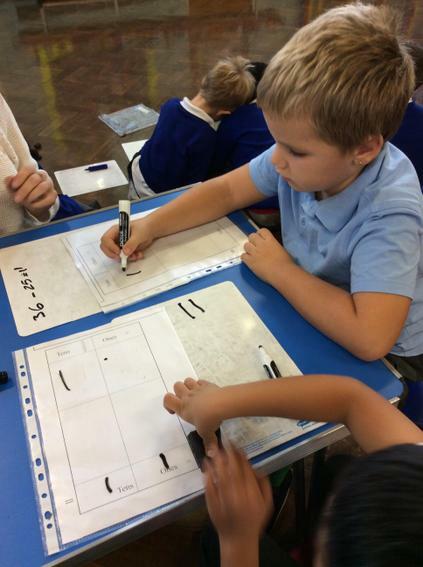 In the workshop we looked at addition and subtraction methods in year 2. 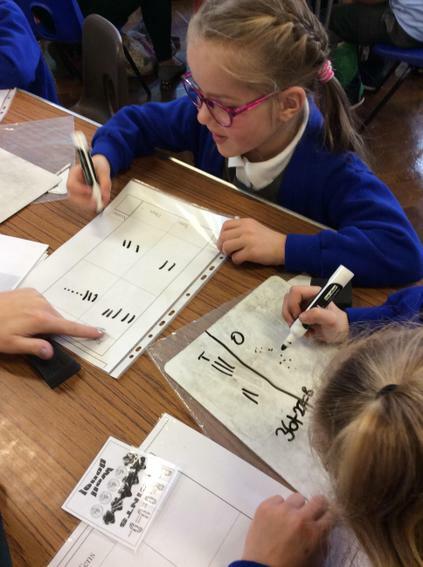 The children and parents were spotted used excellent maths vocabulary like 'tens and ones' and they were great at using their place value grids to help them. Well done everyone! Thanks to everyone who was able to join us. There are photos and links to the documents that we gave out below. 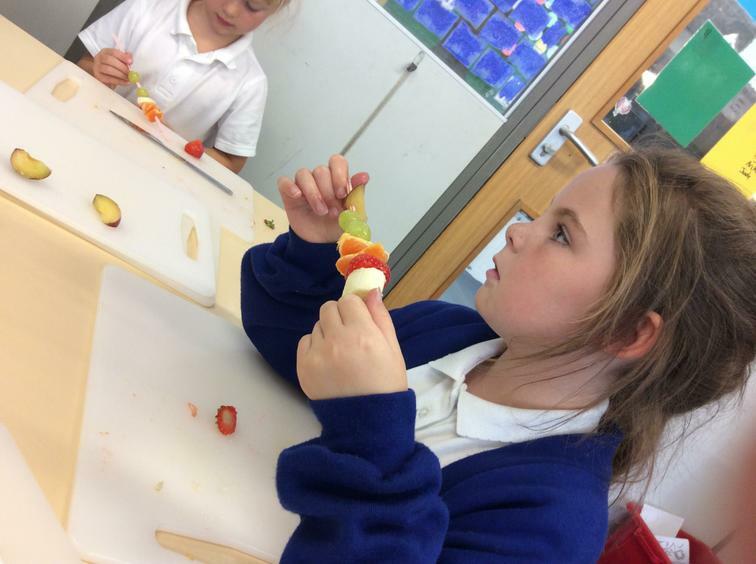 As part of out lighthouse topic we planned and created our very own rainbow fruit kebabs for Mr Grinling's lunch. 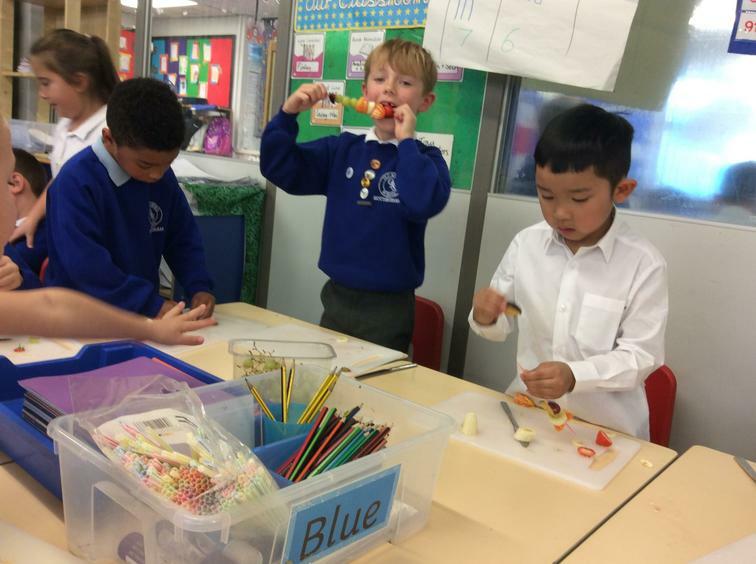 Everyone in year 2 thought they were delicious and we used adjectives like 'sour' and 'sweet' to describe the different fruits. 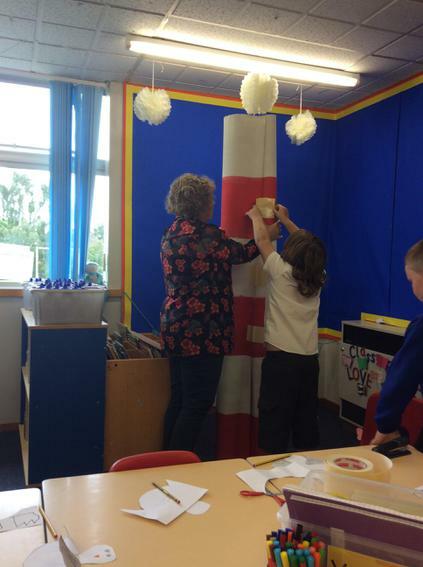 During our 'The Lighthouse Keeper's Lunch' Wow Day, we enjoyed working as a team to make a magnificent lighthouse to stand in the corner of our classrooms. 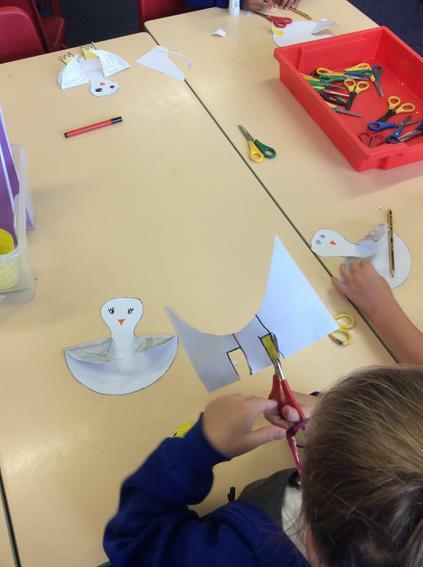 We also made some paper seagulls which have created a beautiful border for our topic display. 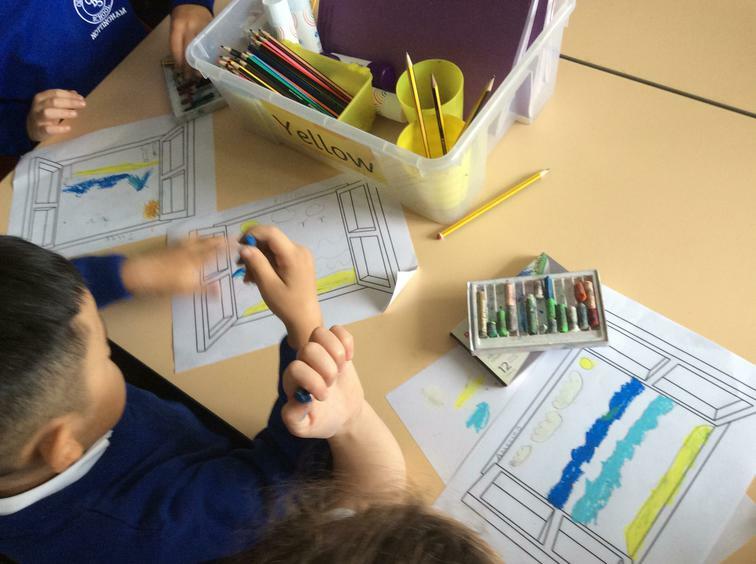 We thought carefully about what might be seen outside of a lighthouse and created some beautiful oil pastel window art work. Here is an overview of what we hope to squeeze into this half term! 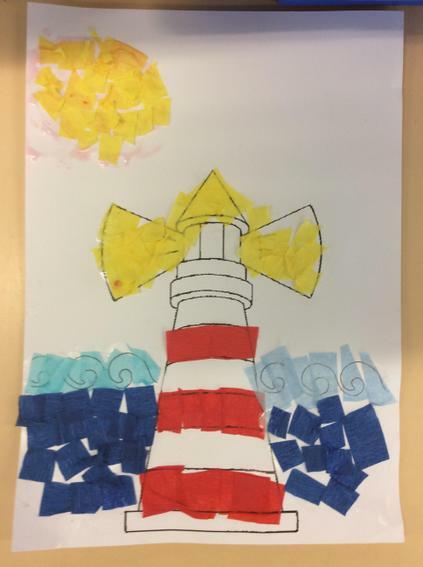 This half term our topic is The Lighthouse Keeper's Lunch. 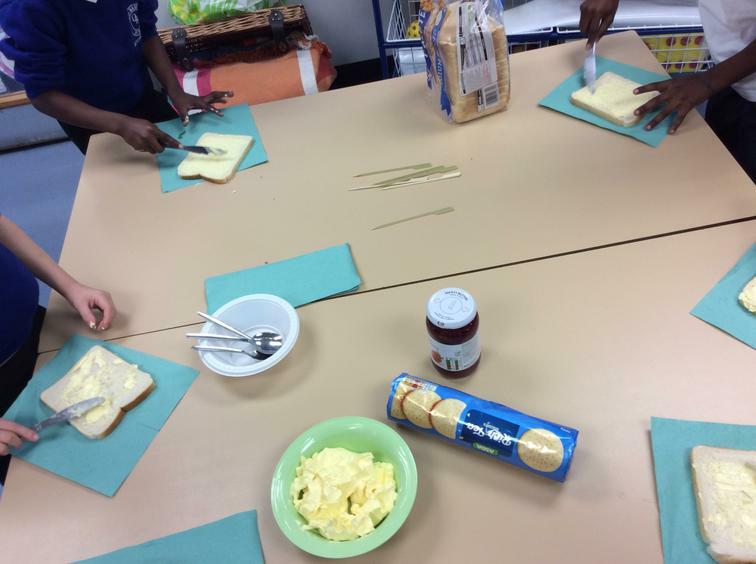 We will be reading the book during shared reading and writing recipes for Mr Grinling's Lunch and an adventure about him. 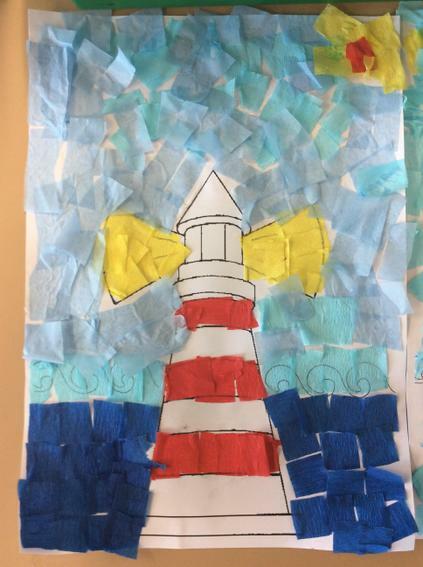 In geography, we will be comparing Nottingham to the Isle of Scalpay in Scotland, where Mr Grinling's lighthouse is and going for a walk around our local area. 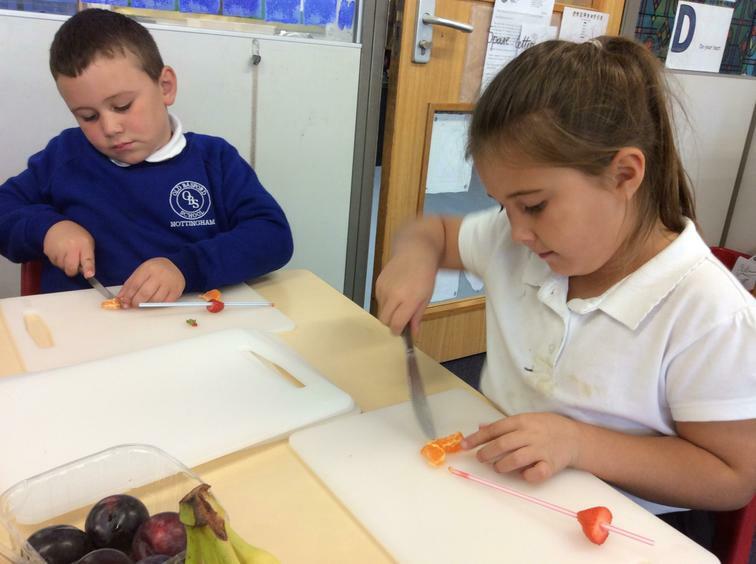 In science we will be learning about healthy lifestyles and in D.T we will be making healthy fruit kebabs. Here is our yearly overview so you have an idea of what we will be learning about each half term. ipads and mobile phones. Click on the link to have a look. What better place to celebrate the end of our topic 'Into the Woods' but Sherwood Pines. Despite the miserable weather we had a fantastic time going on a Gruffalo Hunt, orienteering and map reading, being Nature detectives and building habitats for woodland creatures. We have lots of photos to share with you! Our topic this half term is called 'Into the Woods' which as you can guess is all about forests, trees and woodland creatures. We will read stories with a woodland setting, such as The Gruffalo, Stick Man, Little Red Riding Hood and Into the Forest, which will inspire us to retell the stories, write our own versions of the stories, write diaries and character profiles. 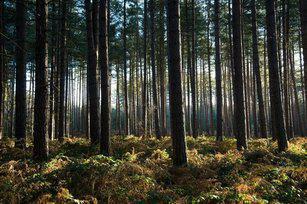 We will learn about woodland habitats and the animals, insects and plants that can be found there. We hope to finish the topic with a trip to Sherwood Pines where we will take part in orienteering activities, map reading and den building. We were so excited this afternoon to have a fantastic hands on African Drumming workshop! 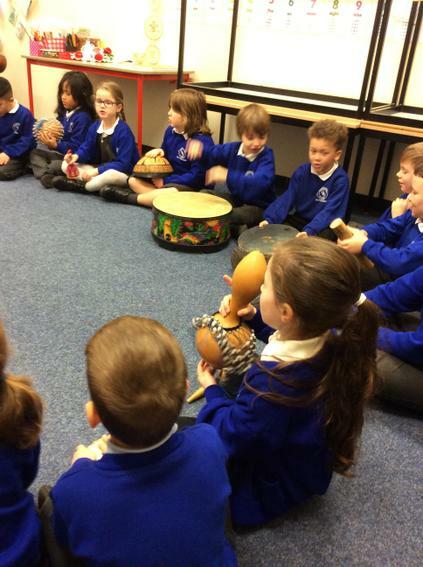 We had great fun learning some drumming patterns, African chants and songs. 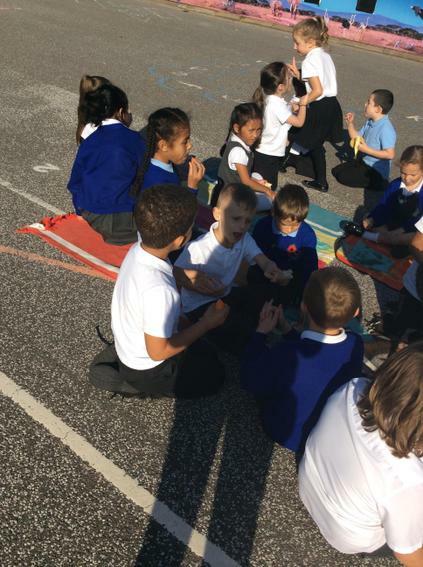 It was wonderful to see the children getting into the rhythm and participating with such enthusiasm! You can enjoy some of the photos below. WOW! WOW! WOW! Just look at our INCREDIBLE book character costumes in Year 2! ​We felt like we were in the land of a living library! 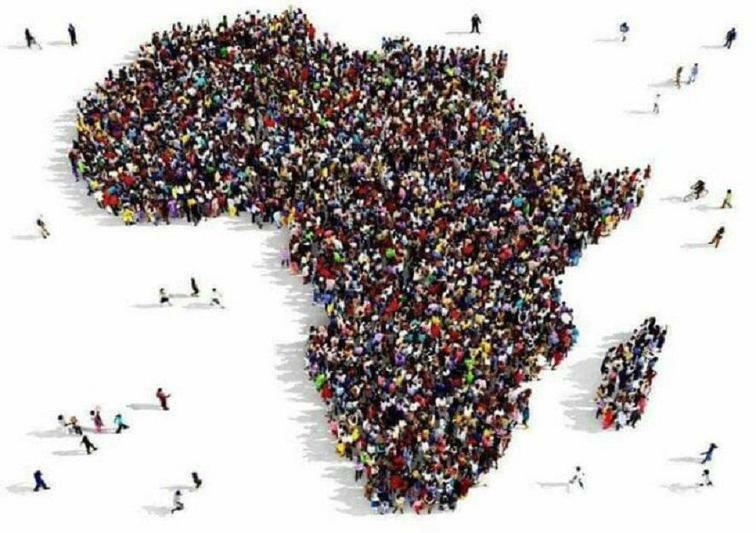 Our topic this half term is all about Africa. 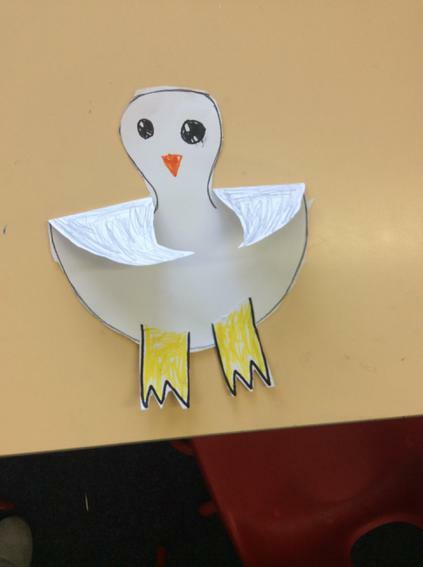 This is a fun and creative topic and one of our favourites to teach! 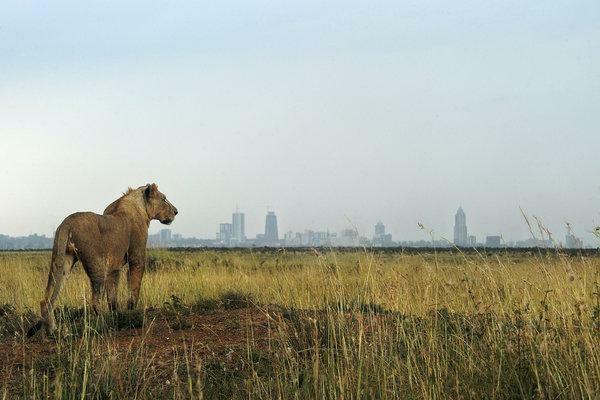 We will be looking at stories and poems about African animals and use them to inspire us with our own writing. The children will compare life in African countries to their own, finding about similarities and differences. 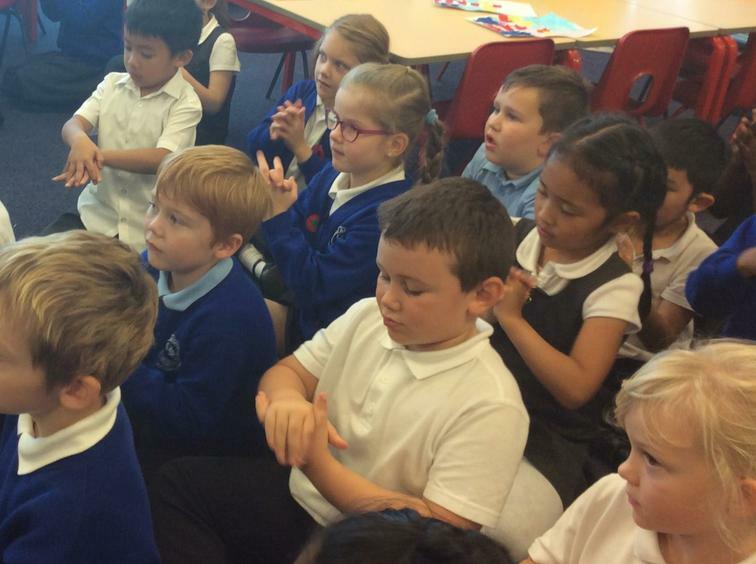 We learn African songs and have a drumming workshop, which we can't wait for! There will be lots of opportunities for art work and we will be tie-dying t-shirts that the children can wear on our Africa celebration day (26th March). 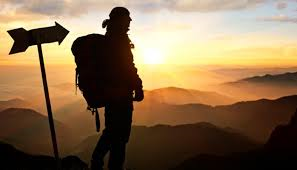 Our topic for spring 1 is about transport, journeys and explorers. 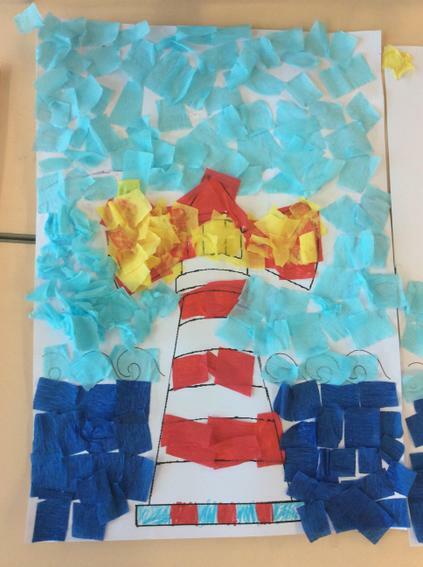 During this topic we will learn about fictional journeys in literacy that will help us write stories with repeating phrases, character profiles and our own version of a story based on a journey. Then afterwards we will learn about famous explorers which we will write about in information texts. 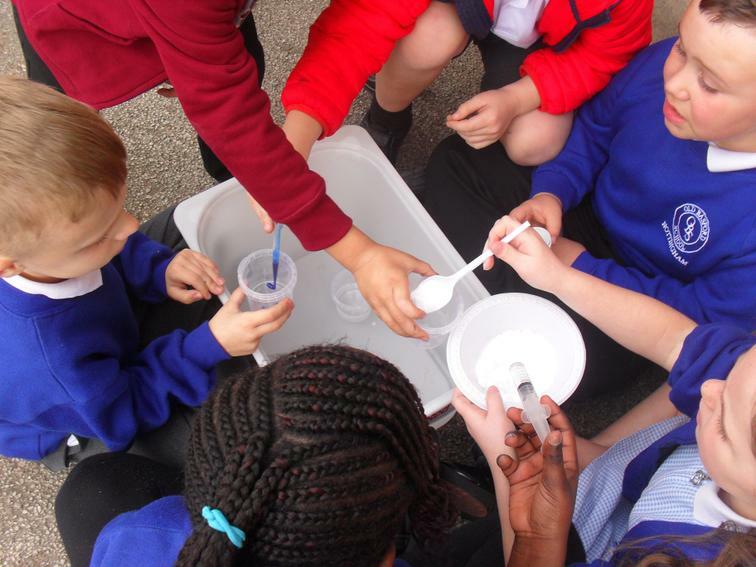 In science we will do investigations into floating and sinking to help us choose the write material for making our own boats and how to keep a drink warm and which would be the best insulator for our drink. Obviously, the topic will bring in some map skills in geography. 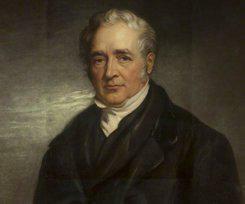 We are starting with trains and looking at the very first trains made by George Stephenson. If you would like to learn more about him, click on his image below. Can you name any famous explorers? Can you name any materials that are good insulators? ​What is to the west of ______ in the picture? WE HAVE BEEN READING GEORGE'S MARVELLOUS MEDICINE IN CLASS. 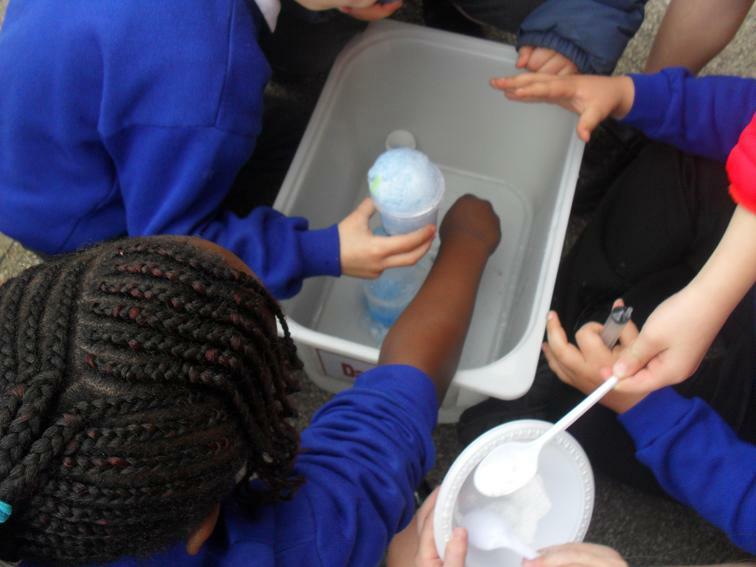 IN A SCIENCE LESSON WE COMPLETED OUR OWN MARVELLOUS COLOUR EXPERIMENT. We were very pleased to host our first workshop of the year this week on the subject of reading. During the session we were able to share techniques to use when reading at home, especially focused around the different types of comprehension questions the children experience in school. Thank you to all the parents who were able to make it this time. We hope it gave you some useful tips. The feedback was very positive and we look forward to running more workshops with you throughout the year! 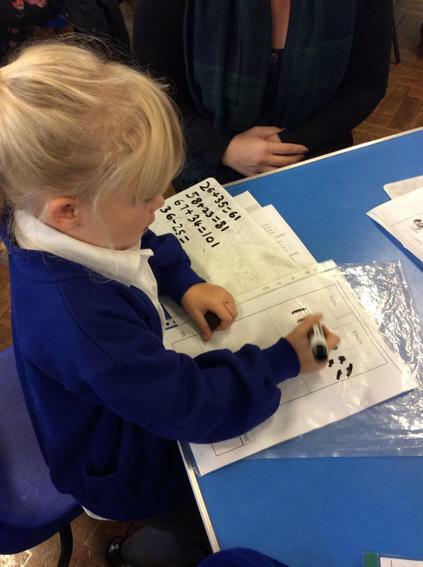 We had a very busy day on Thursday 23rd November as we had another visitor in Year 2! In the afternoon a real life, modern day Florence Nightingale/ Mary Seacole came into school to tell us all about what it is like to be a nurse in a modern hospital. We were extremely proud of the children as Ellie commented on how they asked her sensible and mature questions about her job. We wanted the children to compare the role of a modern day nurse to that of a nurse in the Victorian era and realise how very different the job is. They asked her questions such as how long it took her to train to become a nurse and what her favourite [art of the job is.The children listened incredibly well and some were even used as patients! 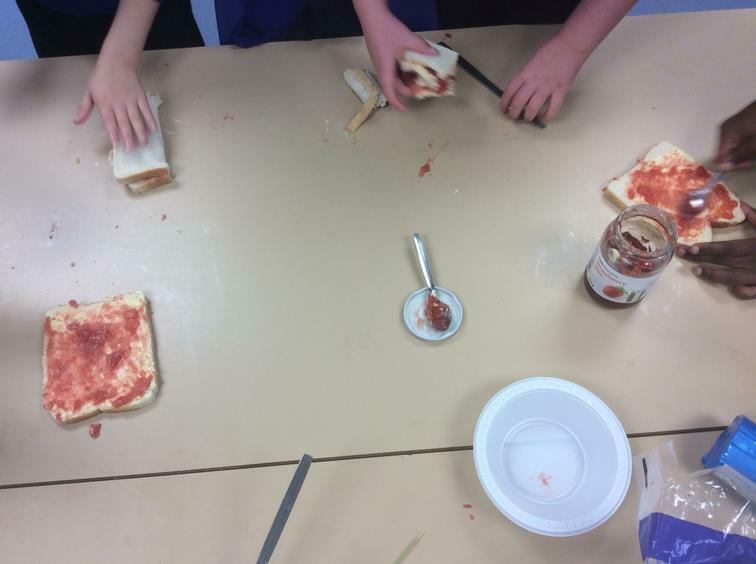 Have a look at some of photographs of the afternoon. Year 2 have enjoyed a fantastic morning with our school patron of reading Chris White. 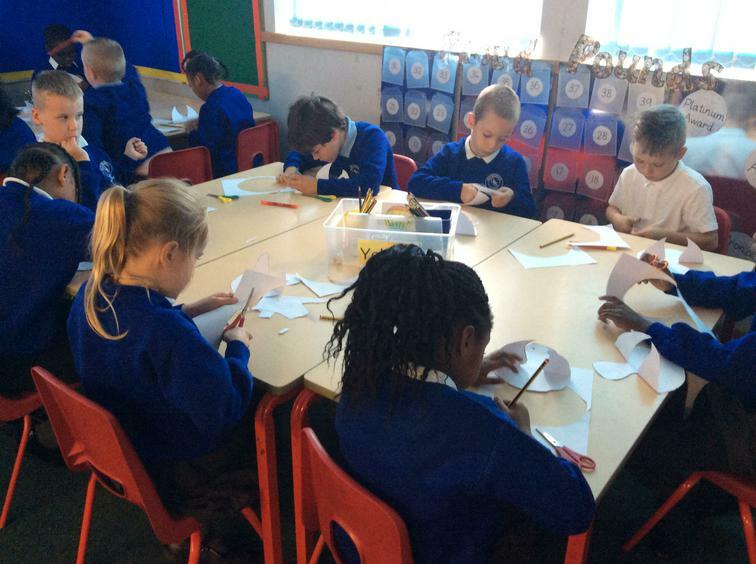 We created our own alien characters and came up with funny poems about them. 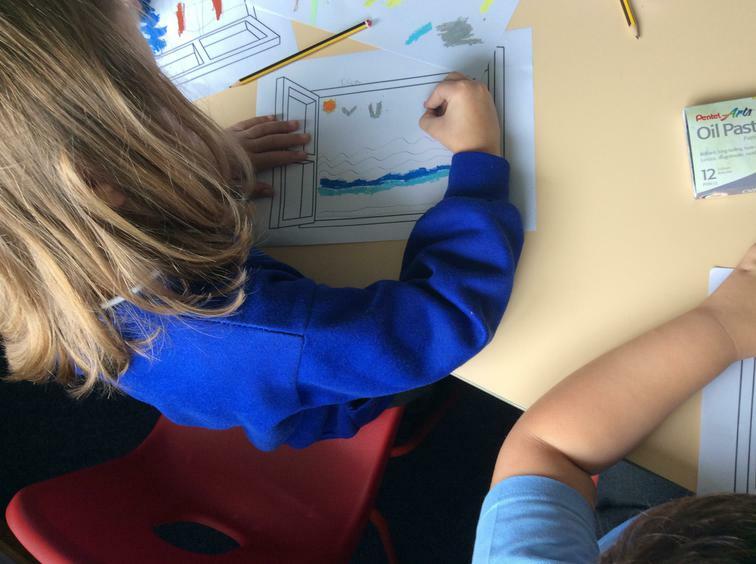 Then in the afternoon Chris worked with a smaller group of children to inspire their creativity and help with their poetry, rhyming and cartoon drawing skills. The children looked fantastic today dressed up for Children in Need. Thank you! 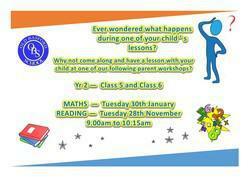 Our topic for Autumn 2 is called 'Marvellous Medicine!' 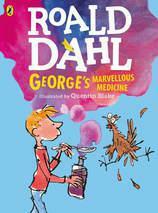 during which we will, of course, read Roald Dahl's 'George's Marvellous Medicine. Lots of our activities in literacy and other curriculum areas will be linked to this fantastic story. We will learn about keeping healthy and how medicines are important for this but also the children will learn how medicine can be dangerous if taken inappropriately. 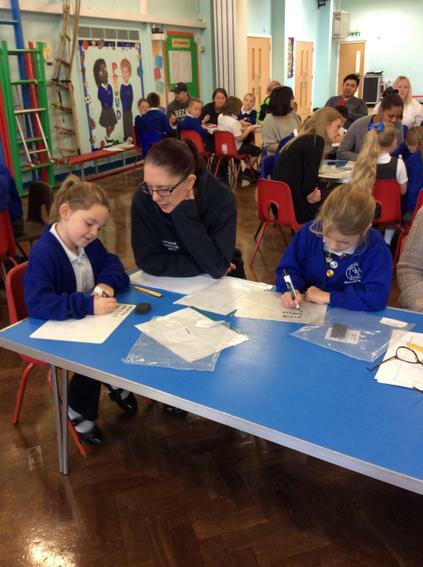 The children will also learn about the lives of two famous historical figures, Florence Nightingale and Mary Seacole, and will compare their roles to the jobs of current day nurses. HERE ARE SOME OF OUR AMAZING HOMEWORK PROJECTS BASED ON BLACK HISTORY MONTH. Today we have had a fantastic time celebrating the end of our Katie Morag topic. The children look fantastic in their outfits and have made a great effort to look the part. Thank you so much for your support in making this a fun day. 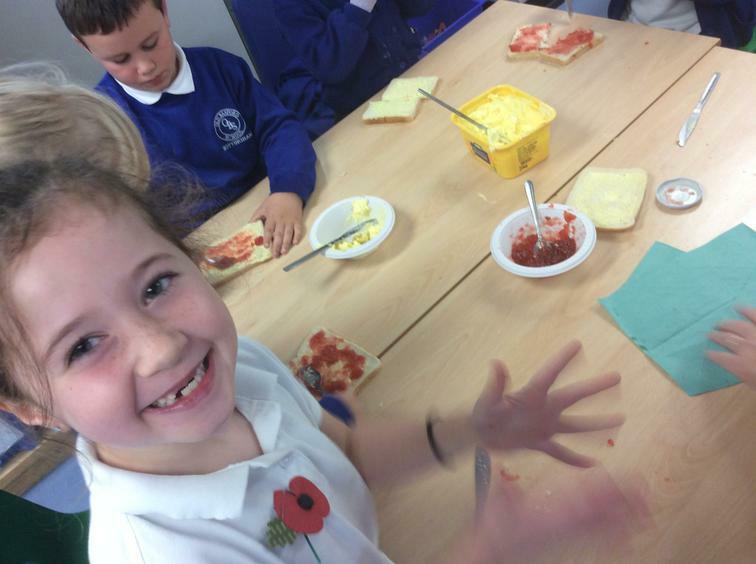 All of the children had a little Scottish breakfast as they made and tasted some porridge. We have had our own version of 'Highland games'. Instead of throwing the hammer, we had a welly wanging competition and instead of tossing the caber we tossed foam tubes! Our winners were Atif, Hari, Jasmine and Harvey W. We also had 'Tiresome Ted' team races. 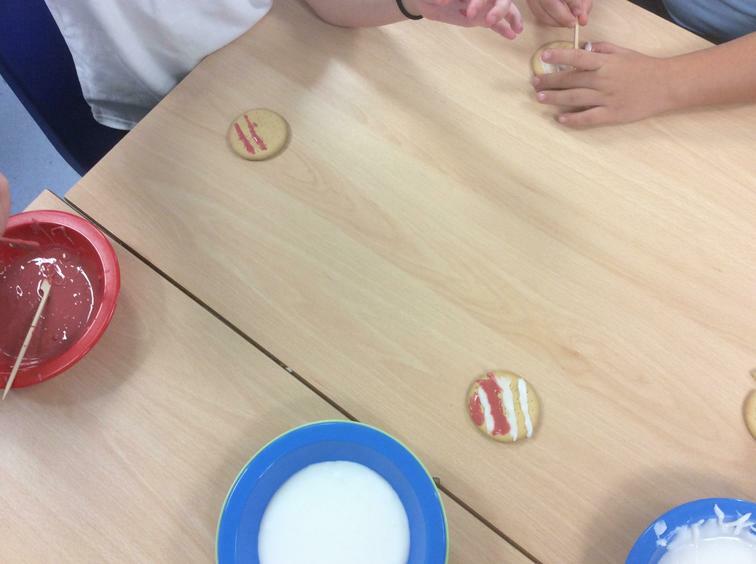 At milk time, the children enjoyed a Highland shortbread biscuit! After that they were all ready to have a fun session of Highland dancing. 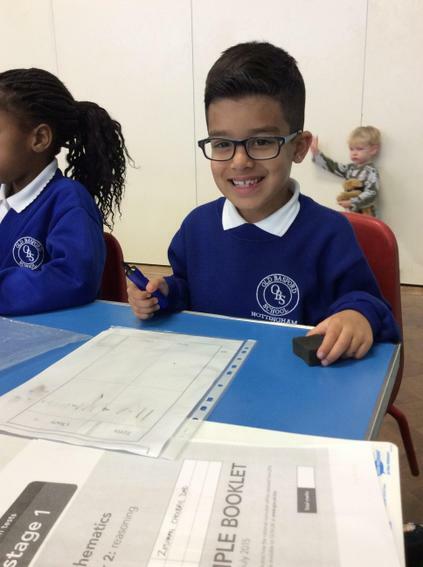 It was lovely to see everyone with a smile on their faces! We have had a very special day, one that the children will enjoy telling you about and hopefully remember for a long time! Take a look at some of the photo highlights of the day. 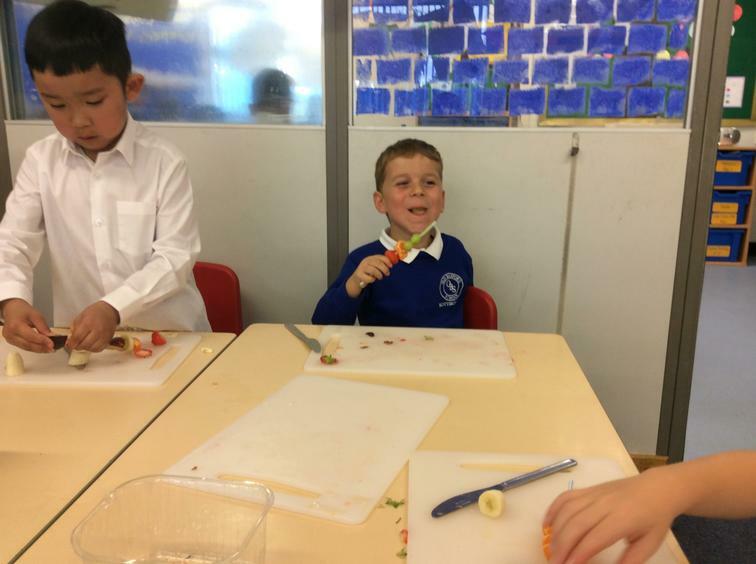 This week the children have been learning to write Instructions in Literacy so we made fruit Kebabs and they were delicious. 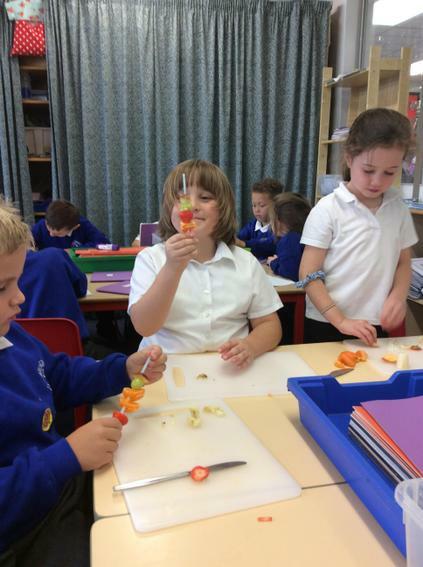 We were then able to write a set of instructions for making fruit kebabs thinking carefully about all the key features we needed to include. 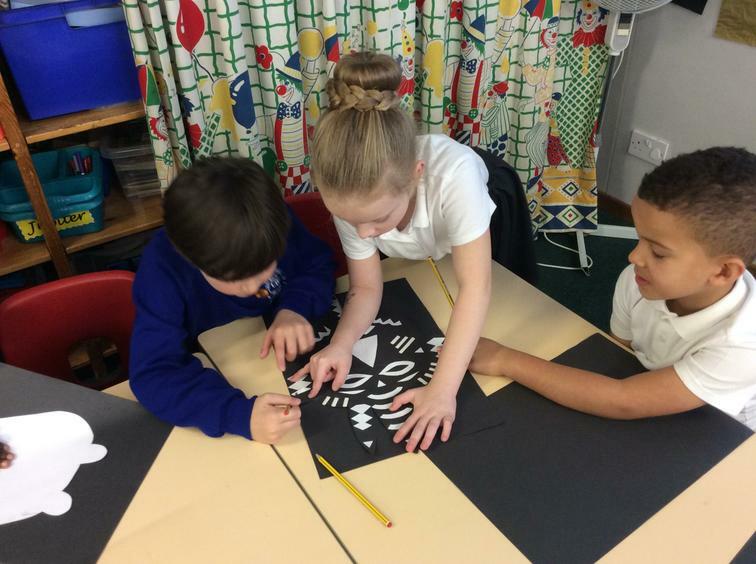 This week the children have designed their own tartan patterns. 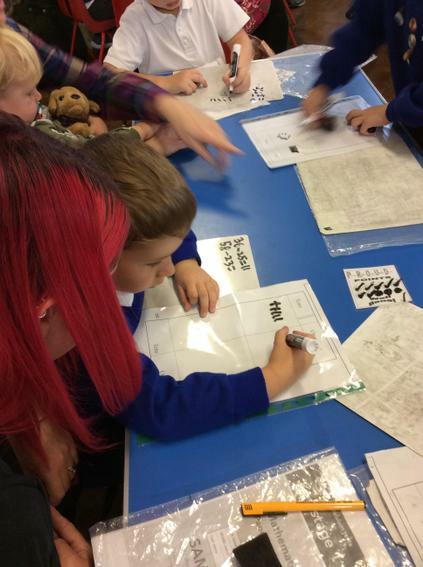 We looked at Mrs Tee's tartan kilt and we explained to the children that Scottish family names have their own pattern. The children thought about the pattern and the colours that they would have for their family name. 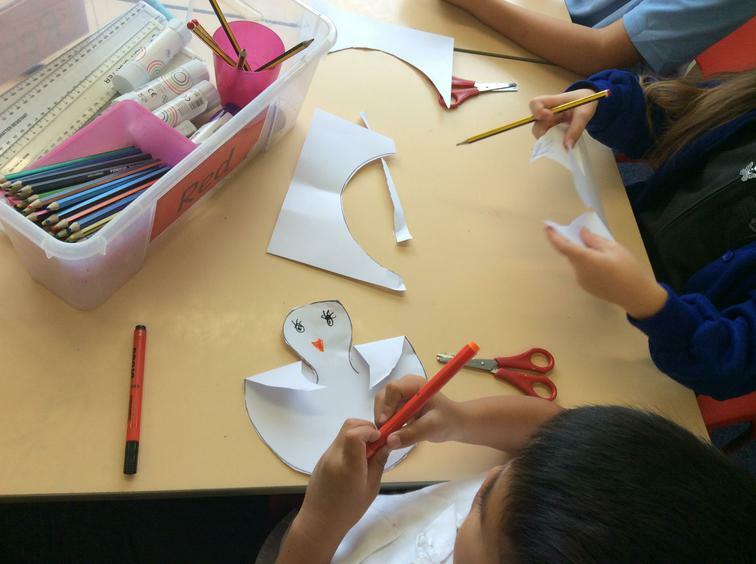 After they had made their patterns they turned them into kilts with a belt and a sporran. They look very colourful and effective. Take a look at our photos. 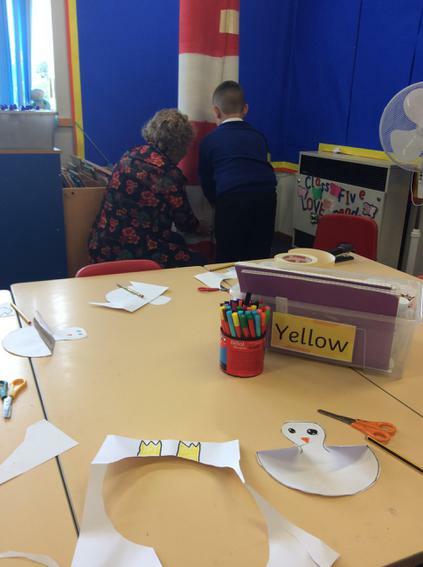 We had lots of fun during our Harvest festival celebration. 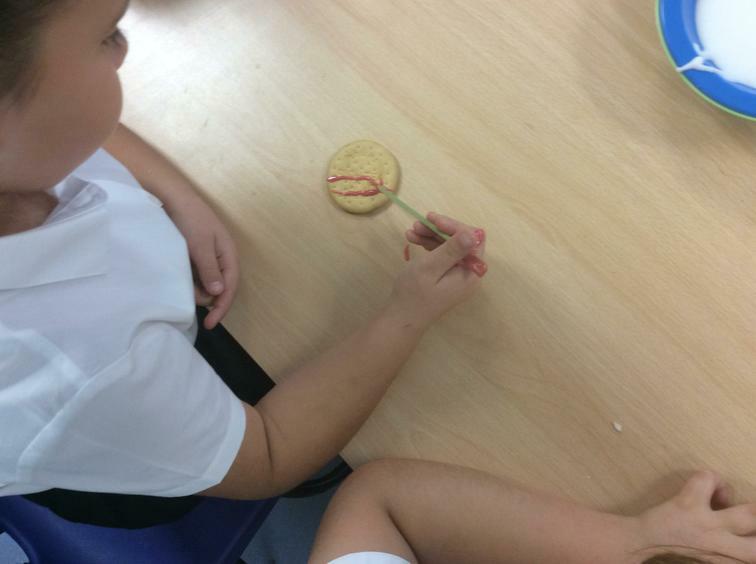 We worked in groups to make faces made from rice and pasta shapes based on the art of Archimboldo. 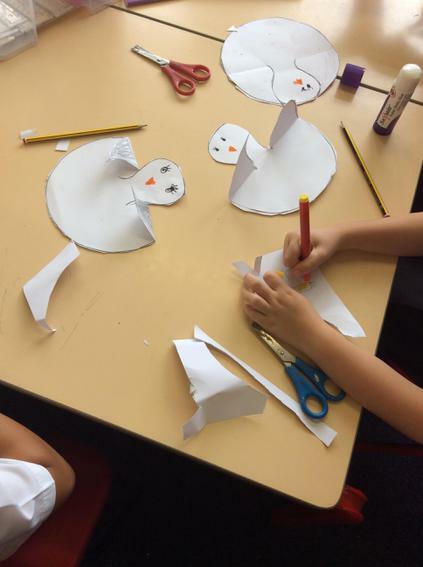 Take a look at some of the faces we made. We also read 'Oliver's Vegetables' and designed our own vegetable patches by printing with vegetables and labeling each row. 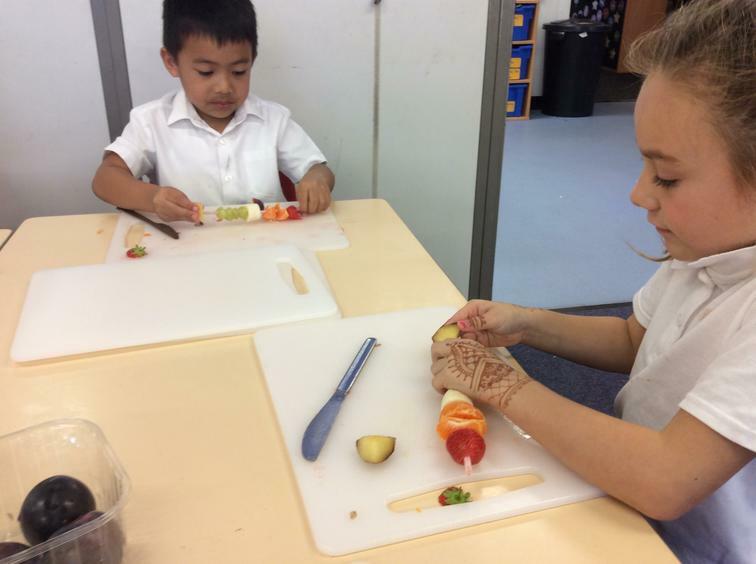 We made Harvest apple and pear smoothies. Everyone finally chopped the fruit, we added plain yogurt and a little apple juice and then whizzed it up in the blender. 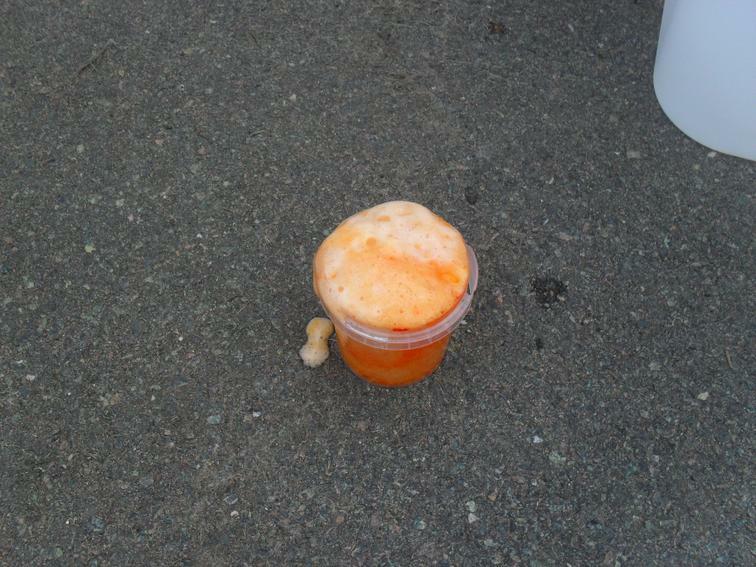 Some people thought it tasted delicious but some did not like it all! Our first topic in the Autumn term is all about the stories of Katie Morag who lives on the fictional Scottish island of the Isle of Struay. The author Mairi Hedderwick based the stories on her own life on the real island, the Isle of Coll. We will have lots of fun learning about Katie Morag's adventures, comparing her life on the island to ours in Nottingham and use the story as inspiration for cross curricular activities. 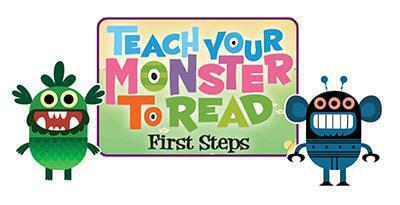 On the Cbeebies website there are games and activities linked to Katie Morag stories. Click on the image to find out more.